In the lead up to the 10th anniversary of the Responsibility to Protect (R2P) agreement, pillar II (which refers to international assistance with state consent) was heralded by the United Nations Special Advisor on R2P as the most promising aspect of the Responsibility to Protect. With so little written on pillar II, however, it is difficult to evaluate this judgement. Addressing this lacuna, this article scrutiniSes the promise of pillar II to highlight two key strengths. First, the consensual support for pillar II among UN member states reveals that even those that were critical of the R2P in the aftermath of Libya in 2011 still favour the idea of international assistance. At the same time, there remain concerns over the use of force within pillar II as illustrated by events in Côte d'Ivoire in 2011. Second, the utility of pillar II lies in its potential for addressing the threat posed by non-state armed groups. This is particularly important when one considers that in thirteen of the fourteen years since 2000, rebel groups (rather than governments) have been the primary perpetrators of one-sided mass killing against civilians. 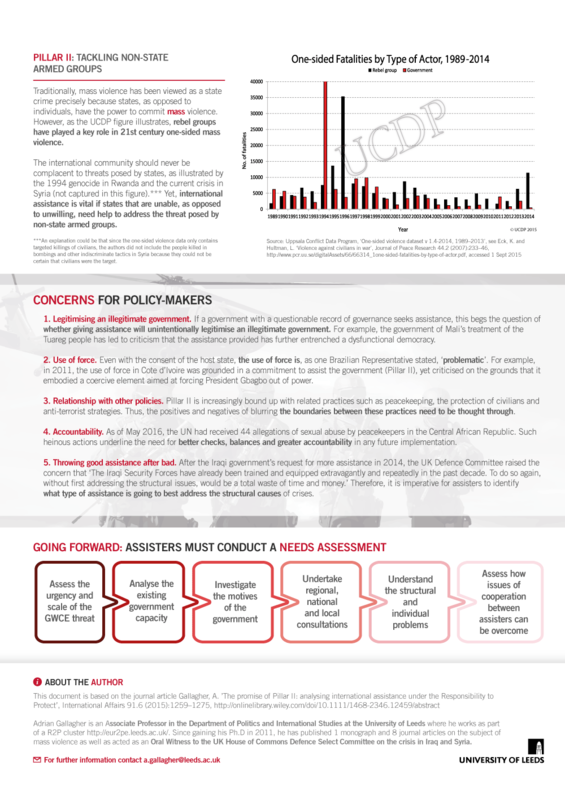 Accordingly, pillar II can be seen to hold considerable promise for tackling the threat of mass violence by non-state armed groups in the twenty-first century. However, the article also raises concerns over unintentionally legitimiSing illegitimate governments through assistance. 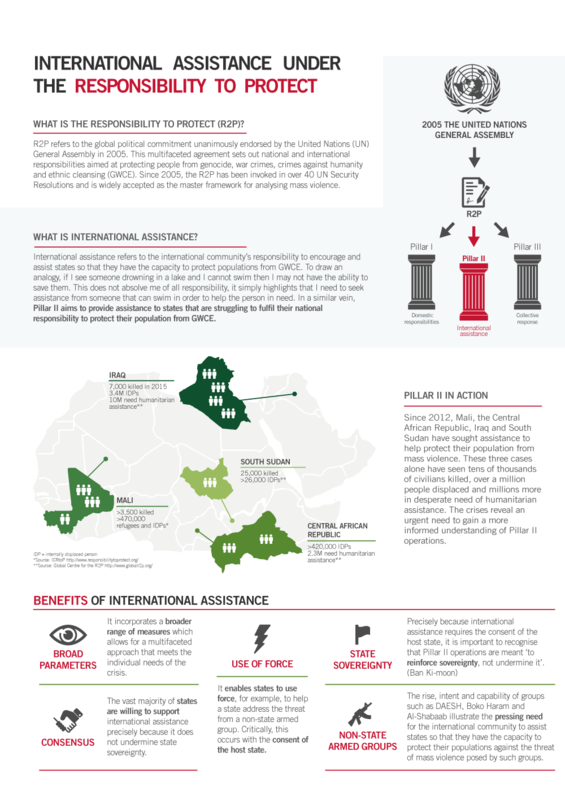 To illustrate these points it draws on the assistance provided in Mali (2013–15) and Iraq (2014–15). This document is based on the journal article written by Gallagher, A. ’The promise of Pillar II: analysing international assistance under the Responsibility to Protect’, International Affairs 91.6 (2015):1259–1275.